If you are looking for an affordable, luxury lifestyle in a quiet and intimate setting, Il Regalo may be the place for you. 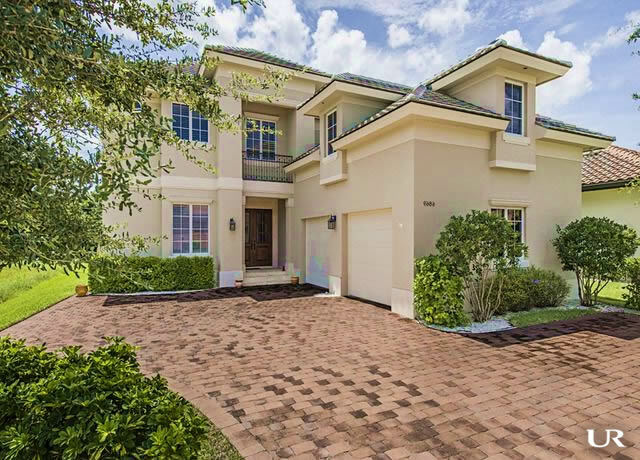 Il Regalo is a small, gated community of 35 custom residences built by Imperial Homes, a builder with an excellent history in Florida and the Naples area in particular. Although each home is unique, they share the same stylish exteriors that include barrel tile roofs and paver driveways. In fact, Il Regalo Circle is also constructed of individual pavers, adding yet another rustic touch to the entire community. Royal Palms decorate Il Regalo Circle, enhancing the rich exterior architecture of the homes. Sidewalks, a luxury not found in many communities in Southwest Florida, further enhance the lush landscaping. As with any community, location is important. This is particularly true when looking for affordable, luxury housing in the Naples Area. Il Regalo is south of Orange Blossom Drive, less than half-a-mile west of Airport-Pulling Road, and between Vanderbilt Beach Road on the north and Pine Ridge Road on the south. The entrance is less than 600 feet south of Orange Blossom Drive on the east side of Yarberry Lane. Since Yarberry Lane is not a through-street, traffic outside Il Regalo is minimal. This peaceful location is ideal for many reasons. Vanderbilt Beach, voted the 5th most relaxing beach by U.S. News & World Report, is only three miles northwest of Il Regalo. Vanderbilt Beach and Vanderbilt Beach Park have more than 425 parking spaces for public use. Amenities at the beach include beach equipment rental and plenty of food concessions. The popular Mercato shopping and dining district is just two miles away. The Mercato offers a pleasant experience day or night. Exceptional dining options include McCormick & Schmick’s, the Bravo Cucina Italiana, and The Capital Grille. Clothiers like Tommy Bahama and Protocol complement the many boutiques in the Mercato. Closer by, the Collier County Library is on the north side of Orange Blossom Drive, just across the road from Il Regalo. Costco, Lowe’s Home Improvement, Kohl’s, Best Buy, Petco, and a Regal Cinema are a few minutes south on Airport-Pulling Road. Investors planning to purchase a home in Il Regalo should know that leases are limited to no less than 30 days and no more than one year. A home may be leased no more than three times in any 12 month period. Il Regalo is a great place to raise a family in the Naples, Florida area.